Matcha, the amazing new Green Tea. Find out why the nutritionists are mad for Matcha Green Tea, a powder made from Green Tea, that’s even more powerful than the regular Green Tea. Matcha Green Tea is a long standing tradition of Japanese culture and is the highest quality powdered Green Tea available. Made from the nutrient-rich young leaves picked from the tips of shade-grown Camellia sinensis plants from Japan. Antioxidants, are something all the health-conscious individuals seek from foods. 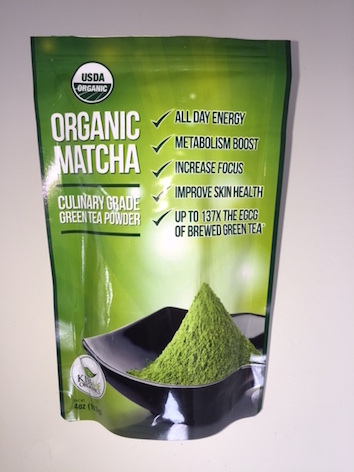 One cup provides over 5 times as many antioxidants as any other food, Matcha has the highest rating by the ORAC (oxygen radical absorbance capacity) method, which have been tied to protect against heart disease and cancer, as well as better blood sugar regulation, blood pressure reduction and anti aging. Not all antioxidants are created equal. Matcha Green Tea is loaded with Catechin, which is the most potent and beneficial of all antioxidants, very important for fighting cancer. Scientists have found that Matcha Green Tea, has over 100 times more EGCg than any other Tea on the market. Matcha Green Tea has been used by Zen Buddhist monks, to help meditation and relaxation, while remaining alert. In order to reach a high state of consciousness, we need the amino acid L-Theanine, which promotes the production of alpha waves in the brain, which induces relaxation and also dopamine and serotonin, two chemicals that help enhance the mood, improve memory and promotes better concentration. Matcha has 3 times more caffeine than a cup of steeped tea, about the amount in a cup of brewed coffee, Match creates an ‘alert calm’ due to the substance I-Theanine. The combination of some nutrients in Matcha can enhance your energy. Samurais used to drink Matcha Green Tea, before going into battle for endurance. Matcha Green Tea increases metabolism and help the body burn fat, four times faster than average without increasing the negative effects of heart rate and high blood pressure. Matcha Green Tea is high in chlorophyll and is capable of removing heavy metal and chemicals toxins from the body. Matcha has antibiotic properties, which promotes good health. One cup of Matcha Green Tea, provides good quantities of Potassium, Vitamins A & C, Iron, Protein and Calcium. Matcha is high in the antioxidant, catechins, which protects your brains against aging and memory loss. It’s great for your kids, because it improves the memory, concentration and mental alertness. 10_Improves Skin health, hair shines and nails health. A study published in the ‘The Journal of Nutrition’ found a connection between drinking Matcha Green Tea and skin health, thanks to the great amount of Catechins. They also found that the skin was better protected from the harmful affect of UVrays, it improved blood flow and oxygen increase to the skin. What is the dosage you can use. There’s no limit for using Matcha throughout the day, but for a cup of tea, is recommended a half teaspoon of the powder Matcha Green Tea. For optimal results, use 3 Tablespoons Matcha Green Tea daily, in different ways in all your foods. Matcha has a wonderful taste, unlike a lot of other teas. Matcha doesn’t require sugar, honey or milk. Taking a cup of tea is not the only way to consume Matcha, it can be part of your delicious smoothies and drinks. Besides your regular cup of tea, Matcha can be added to your juices, smoothies, yogurt, muesli and all foods. Fill up a pitcher with water and add the juice of one lemon, 6 mint leaves, (Stevia for sweetness, optional) or two teaspoons of coconut sugar and one teaspoon of Matcha. Stir well and keep in the refrigerator, and drink as many times as you wish. You can add Matcha to your omelet, quiche, egg whites, vegetables, beans, chicken, fish or meats. Use from ¼ to ½ teaspoon for each portion. It’s excellent to use with tabbouleh, or any Middle Eastern dish. A dash of Matcha Green Tea makes your soup even more nutritional. Use Matcha Green Tea with fat free or low fat ricotta cheese or low fat cottage cheese as a snack. 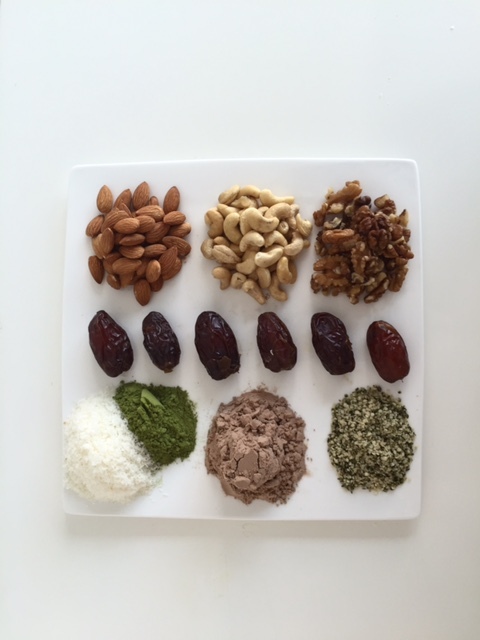 Try my Protein Coconut Matcha energy bar recipe, below. Add a half teaspoon of Matcha Green Tea in your granola. Make ice cream with Matcha Green Tea. Mix low fat plain yogurt and ½ teaspoon Matcha Green Tea, one Stevia packet (or one teaspoon coconut sugar or raw honey) and freeze. It a great chill out for summer time. Full of healthy fat and protein, this creamy, almond buttery pudding has some serious staying power and tastes like an indulgent dessert. ½ cup almond, coconut or rice milk. One tablespoon raw cocoa or unsweetened chocolate nibs. ½ teaspoon Matcha Green Tea powder. This is an excellent breakfast or snack. 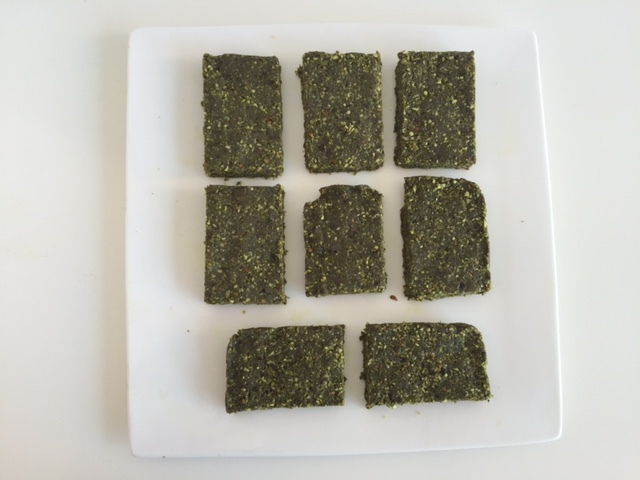 Protein Coconut Matcha energy bar recipe. These bars are great for a pre-or-post workout, or for a morning pick-me-up. Combine almonds, cashews, hemp seeds, Matcha powder, vanilla, protein powder in a food processor and pulse until well-combined. Then add the dates and the coconut oil, and pulse until mixture stick together. Line the mixture in a small baking dish with parchment paper, and add the coconut flakes and press down with your hands until the flakes are inserted in the mixture. Press the mixture down until it is compacted and smooth. Place dish in freezer for 1 hour. After 1 hour remove bars from dish by pulling out the parchment paper. Cut into 8 bars and wrap with parchment paper if desired. Store in fridge for up to 1 week.